A timber frame home or barn built by Sweet Timber Frames will give you a sense of warmth, space, and tradition that no other building style can offer. This style was the choice among New England’s first colonists and has withstood the test of time. Today, our Maine timber frame homes make for structurally unique houses, cottages, studios and barns. Timber framing is adaptable to traditional and contemporary design styles. We frequently work with our clients’ designers and architects, and we also offer a selection of timber frame designs you can choose from (note: we do not have any timber frame kits). Most often, we create a completely custom timber frame design for our clients. If you have a concept of what you are looking for — a simple floor plan with dimensions on graph paper are a good start — we can help to design your home and work with an engineering service to get final approvals for building. Our basic timber frame design includes floor plans, elevations and a roof plan. This would be the beginning of your timber frame structure and home. If we are building a complete turnkey timber frame, more detailed plans will be required. In this situation, we often recommend our client works directly with an architect. Every home we build is custom designed and built just to our client’s requests. As such, we provide pricing information once a final design is agreed upon. 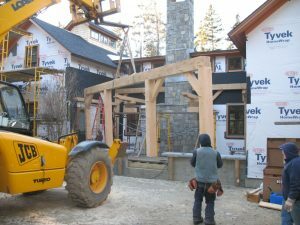 Choosing to work with Sweet Timber Frames means choosing to work with a timber frame builder and fine craftsmen that build in the traditional, hand-joined timber frame techniques. Whether we are buiding a stand-alone timber frame or a “foundation to finish” turnkey home, we handcraft every timber that goes into your structure. This high-quality craftsmanship costs more than a timber frame kit, but results in a much finer, quality end result. We highly recommend you download and read the Timber Frame Business Council Consumer Guide, to better understand what is involved in building (and pricing) your custom timber frame home. • or not to exceed. A payment schedule will be arranged that fits both the client and Sweet Timber Frames. Most payment schedules are bi-weekly. All costs are agreed on before construction begins. Your building project may be done in phases such as the timber frame joinery completed and standing with a weather tight enclosure, and another phase that includes the interior finished home. 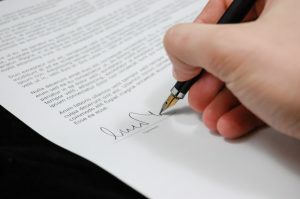 Once your design is complete and we receive a signed contract with deposit, we will begin your project. We typically take 8-12 weeks to build the stand-alone frame, depending on its size and complexity. To erect and raise your frame takes approximately 2 days to 1 week, depending on the size of the frame, site conditions and weather. For a turnkey, “foundation to finish” timber frame, it typically takes a year from start to finish once the designs are complete. We can also add additional crew to shorten the duration of the project. The house is unbelievably gorgeous! We have had a lovely two days and have appreciated every detail – so beautifully considered, each one. Andrew’s parents came over and some neighbors, and loved it! We’ll call before you get this so will get a chance to ask our questions and talk about our next visit. Meanwhile, thank you again for everything, we are so happy with how it’s all turning out!